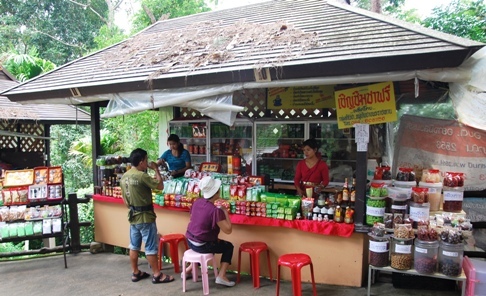 While the nowadays Doi Mae Salong proved to be an ideal procurement source for the entire spectrum of the north Thai tea portfolio, I was yet always curious about how the beginnings on the Doi Tung might have had developed. 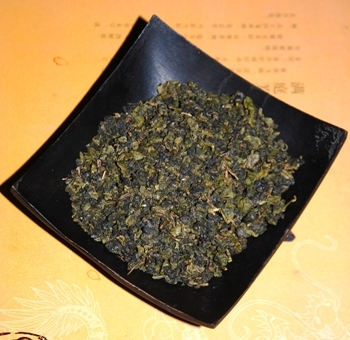 I knew that the cultivars Jin Xuan Oolong No. 12 and Ruan Zhi Oolong No. 17 were cultivated there, and that these teas, thanks to the connections and the good name of the Royal Project, are also available in quite some well-assorted overseas tea shops. To this added the rumors telling that tea cultivation under the umbrella of the Royal Project takes place exclusively according to principles of organic farming. Early in the morning on Thursday, Sep 20, 2012, I board a bus at Chiang May’s Arcade bust station. In little more than 3 hours, this will get me to Chiang Rai, where I am renting a motorcycle for the remainder journey. It’s only a roughly 2 hours ride through the mountains to my destination Doi Tung, while the rich wealth of the panoramic beauties and serene views don’t allow for a dull moment along the way. Now, at the end of the rainy season, the mountains are covered with luxurious green and crops, and the clear September weather enables views, of which I can even hardly guess how far they might really reach. What I do not see is tea gardens, a phenomenon that is due to accompany for quite a while on this journey. In the afternoon, I reach the project center on the Doi Tung, and the Doi Tung Lodge, the only lodging in a vicinity of 20 km. I am welcomed in a friendy manner, and shown a room, which with $US50 per night is not forcibly north Thailand’s cheapest accommodation, but in size, taste, cleanliness and facilities lives well up to even rather “uptown tastes”. From the outside, though, both building and facilities rather seem a bit plain for a posh resort in the old Lanna, which enjoys a worldwide reputation for its traditional (teak wood) architecture. After checking in, I decide to make use of the day’s remainder to have a look around and try and find out, where I will find the one or other photogenic tea garden the next day. I ask at the Lodge’s reception, but the girl there instead tells me the way to Doi Mae Salong, pointing out that there would be many tea gardens there, while there would be rather few on Doi Tung. On my question where these few might be located, she only answers that she doesn#t know. Not very encouraging… No tea gardens on the Doi Tung? I have lived in north Thailand for more than 20 years now, and I thought there wouldn’t be much here that would still surprise me, and I definitely wouldn’t have expected this! Nevertheless, I wouldn’t give up just that quickly. the Royal villa, that local palace of the Thai royal family, which was visited quite frequently especially by the mother of King Bumibhol Adulyadej, who has been in office since 1946 and until present time. 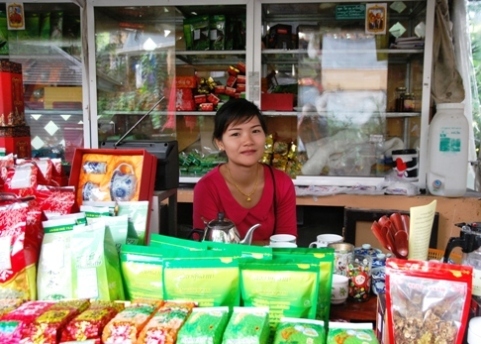 Her picture appears to be omnipresent in the shops and households all around the Doi Tung. the Royal Flower Garden, planned and intensively promoted by the royal mother herself. 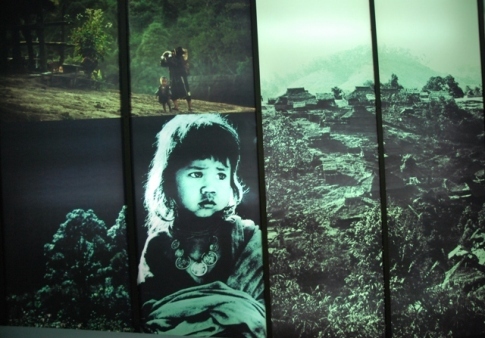 the so-called “Hall of Inspiration”, where artefacts, art works and modern photo/light and video montages around the Royal Development Project on Doi Tung as well as from the life the members of the royal family are on display. 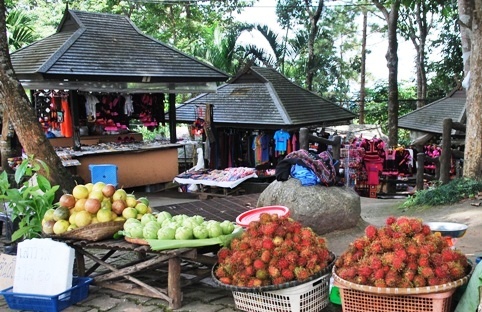 a “Hilltribe Basar”, where member of the various mountain tribes living here sell their typical products. Besides these, there is a number of souvenir shops and stores, where products farmed and/or manufactured under the auspices of the Royal Project are sold, a “battery” of ATM machines, worth mentioning primarily due to their visual appearance, and the facility’s own restaurant, which besides typical Thai dishes offers also offers a small range of western standards. You will even get a good bottle of wine here, and the prices are surprisingly moderate, given the the restaurant factual monopoly position. Meanwhile, nightfall is nearing. I would love to pay a visit to that Hilltribe Basar, but find it alreaedy closed, so I postpone this visit to the next day, too. Strolling around, I find a village of the Akha, one of the local mountain tribes. 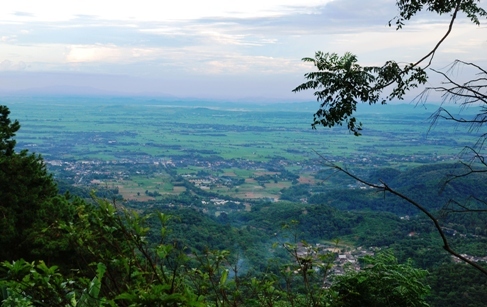 The people living here might be comparably poor and earn their living with their hands’ work, but they definitely enjoy one of the most astonishing panorama views you can possibly dream of right at their doorsteps. I spend a nice and relaxed remainder evening, partly in the said restaurant, enjoying a Steak dinner and a glass of the said wine, and partly on my room’s balcony, where I am ending this day. There are zero alternatives to this on the Doi Tung, however, this has its positive side to it: the serene silence, and the peace surrounding me. My first morning on the Doi Tung starts with an abundant breakfast in a Cafe belonging to the facility, where locally cultivated Doi Tung coffee, another blessing owed to the Royal Development Project, is served. The excellent coffee consoles me a little for the fact that also here, there is no tea, and I have not come even a millimeter closer to the fulfillment of this journey’s main mission yet, finding the tea gardens of the Doi Tung. Firmly decided to to continue to keep the goal in sight, as well as to have a good time anyway, I take on my sightseeing tour through the local attractions. The joint ticket, a collecting ticket for all attractions listed above, suggests to start with the Royal Villa. The first thing that catches the eye after the 500 m long footpath to the Royal Villa is that this local residence of the Thai royal family isn’t even close to the idea we will usually have when thinking of a palace. “Villa” clearly is a better match, and, to be honest, from the ouside, the royal villa has a rather modes appearance even for such. Splendor ise actually radiated only by the gardens surrounding the villa, but by these even in a more luxurious fashion. It becomes obvious that the king’s mother, who has spent much of her time here, felt and maintained a deep passion for the skillful arrangement of flowers and green plants. At the entrance, I am handed out some headphones and a player. Shoes are to be removed before entering the premises. I am asked for my nationality, and after I have outed myself as a German (“khon Jörman”) on request, my player is adjusted to speaking to me in German. Inside, taking photographs is strictly forbidden, cameras must be left outside during the tour of the house. My apologies to the surprised reader, pictures of the royal villa’s interior are therefor missing in this report, as are photos of the private rooms of the royal family. The latter, however, also remain hidden to physical visitors, for reasons of respect for the royal family and their private sphere. While the player, via the headphones, tells me excerpts of the Royal Development Project’s history and the life of the royal mother, I pass through an extensive entrance hall, then through an even more extensive reception hall, then I am allowed to catch a glimpse (over a barrier) of the really impressively extensive royal kitchen, and then the way intended for visitors to take already leads back out and into the royal mother’s private gardens. As if by command, the player has also reached the end of its explanations and is collected by diligent stuff members. I walk on through the villa’s gardens towards the exit, realizing the omnipresent respect and appreciation of the Thai people towards their royal family impresses me far more than any of the usual splendid palace buildings could possible have done. A kind of awe has taken possession of me, and shall accompany me on the further stages of my sightseeing tour of the royal creations on the Doi Tung. I only realize that I am not on “royal ground” anymore, when I discover that I am the only visitor who still holds his shoes in his hands. My next stop is the Mae Fah Luang Flower Garden, inspired and developed by the royal mother, to which the garden of the royal villa was only a little foretaste. 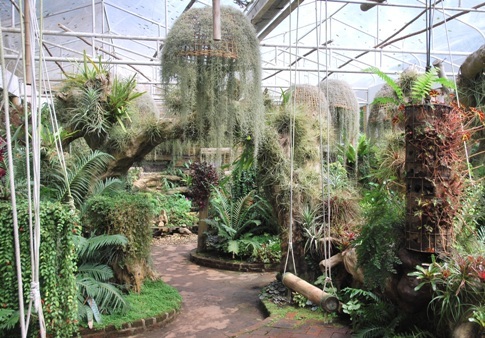 The photo shows only the core park, around which a variety of plant artworks, biotopes and areas dedicted to particular plant species, are grouped. 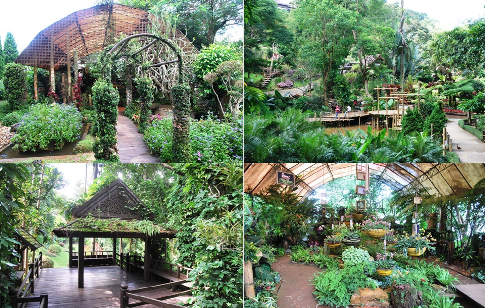 All plants are grown from seeds and offsets in an extensive dedicated in-house nursery and then either used in the flower garden or sold in the project’s plant shop (see picture above). 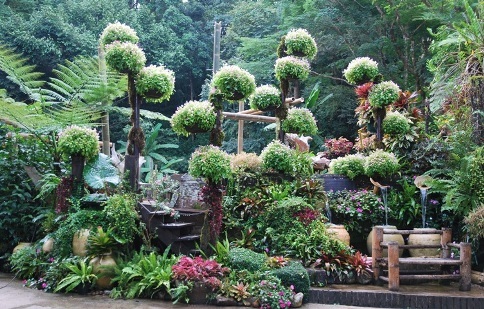 The sculptures, created from green plants and flowers supported by wooden structures suggest that a small army of garden architects must be employed here, and that at least some of them are true artists. Unfortunately, my pictures can convey only a whiff of the impression this total work of art leaves on me, and surely evoke no more than a tinge of the astonishment every visitor to the site must inevitably feel. These sculptures alone, living and thereby ever-changing pieces of art, are already worth the tour of the garden. But other objects, too, reminiscences to north Thailand’s old Lanna culture and the philosophy of the royal development project seamlessly fit into the green, deserve the visitor’s attention. To me, especially the enormous collection of orchids sticks out as one of the garden’s greatest highlights. Of course, also this rich treasure of the most varied types of this multiform species of plants has been arranged here to specific aesthetic criteria and by way of art. Secretly I had hoped to also find a little tea garden or at least a few living exemplars of the species Camellia Sinensis here among this rich variety of exotic green plants and flowers that otherwise doesn’t leave much to wish for, but again nothing: not a single little tea tree, tea bush or even tea leave adorns the royal flower garden. Should “Doi Tung tea” prove to be yet only another legend in the end? I take on the third stage of my sightseeing tour, the Doi Tung “Hall of Inspiration”. 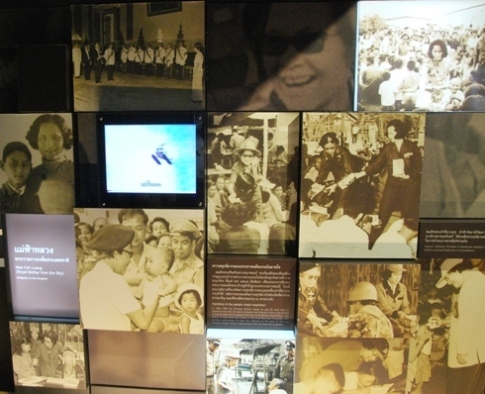 This turns out to be a room-by-room display of artefacts, combined photo, video and light montages, as well as informative material around history and development of the royal development project, the project center on the Doi Tung and the Thai royal family. 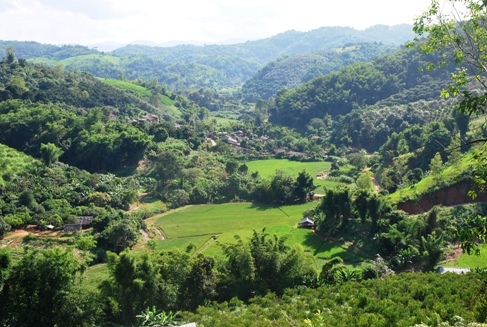 In consideration of the specific local social and economical backgrounds here on the Doi Tung, the main emphasis is given the theme fields purposeful cultivation of a variety of sustainable cash crops instead of single-crop farming and slash & burn agriculture, capacity-building, and substitution of opium cultivation, deemed as socially and economically harmfully, with alternative sources of income. 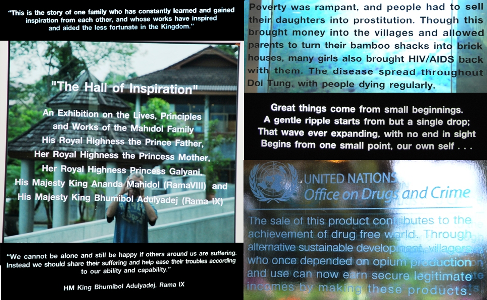 At this, the messages are not only conveyed in transcendental form via picture materials and artistic expression, but also very concretely in form of historic video documentations (shown among others: Adrian Cowells film “The Heroin Wars”) and in the form of text messages on dedicated message boards. Another focus of the exhibition is the life and work of the royal mother, Princess Srinagarindra (civil name: Mom Sangwan), who has invested much heart and personal dedication especially in the development on the Doi Tung, and who is revered by the local population just like a saint. My visit of these three testimonies of the royal family’s engagement here on the Doi Tung and everywhere in the country has left a deep impression on me, characterized by respect and awe. In addition, the insight into Thailand’s more recent history given here helps me to understand the adoration the Thai royal family enjoys within the Thai population throughout the country and across all walks of life. However, even here, in the Hall of Inspiration, I haven’t found even the slightest hint to the alleged tea cultivation and processing initiated and organized by the royal development project, though, of course, I would definitely see a great potential for inspiration in the substitution of poppy fields with tea gardens. The fourth part of my tour of the local tourist attractions, my visit of the Doi Tung Hilltribe Bazar, promises to become a rather casual leg of the program. Since I have seen the products that are typical for the mountain tribes settled in this region on many markets in north Thailand before, I do not really except this to offer anything new. Well, at first sight, things are just as I had expected: besides their agricultural products, the tribes being represented here, mainly Lisor and Akha, offer their traditional silver jewelry works as well as the typical range of woven and other handicrafts. 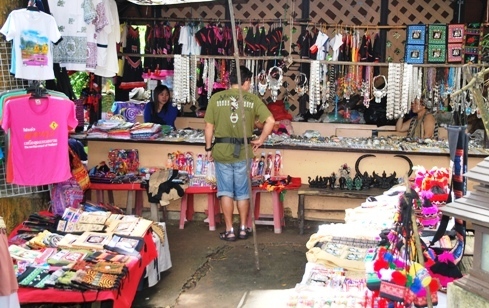 To this add local souvenirs, such as Doi Tung T-Shirts, Doi Tung key chains and similar items. But right here, the big surprise that shall also bring me a good piece of the way closer to my journey’s actual mission, is waiting for me: an incarnate tea shop! Only too readily I follow an invitation to try the local versions of the Ruan Zhi Oolong No. 17 and the Jin Xuan Oolong No. 12 right here at the stall. The friendly young salesgirl explains to me that tea is cultivated on the Doi Tung under the auspices of the royal development project. 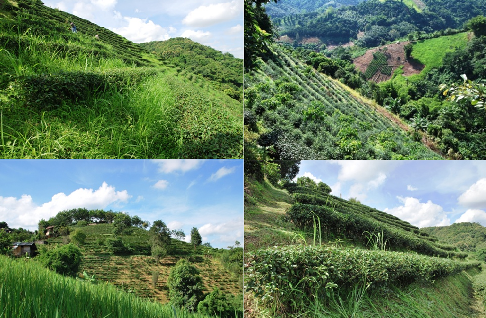 At this, the project helps the farmers with the shift in crop and procedure not only with know-how, convenient loans and tea plants imported from Taiwan, but provides active support with the project’s own processing facilities and distribution network for tea. 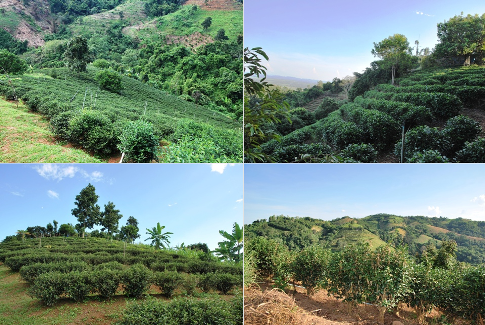 The latter takes place in such way that the project guarantees the farmers to purchase their tea at a minimum price and then uses its own channels to distribute it on the international market. However, a precondition for the purchase by the project is 100% organic farming, i.e. complete abdication of the use of artificial fertilizers, herbicides and pesticides. My further inquiries yield that the girl herself is a daughter of a tea farmer on the Doi Tung, who sells her family’s tea products here on the project center’s hilltribe bazar as well as in a second tea shop near Amphoe Mae Fah Luang and the little village, where her family lives and farms their tea gardens . Of course, she will be able to connect me to her father, and of course, I will be able to purchase organic Doi Tung teas from there. And of course, she knows, where her father’s tea gardens and those of the other tea farmers of her village are located! On my request, she arranges that I will be picked up at the next morning by one of her brothers, who will then guide me to her village’s tea gardens. With this, today’s target has been achieved, and I spend the rest of the day as a simple tourist on the Doi Tung. Only much later, I realize that – in my sudden enthusiasm about finally having found some tea gardens – I completely forgot the arboretum. Well, this is not going to be my last visit to Doi Tung. The next morning, I am picked up as arranged, and after about 1 hour of (mainly offroad) motorcycle trekking, we reach the tea gardens of the small village of Ban Si Phan Rai, inhabitated by a mix of Shan, Chinese and mountain people. On a dirt track that must be in catastrophic condition during the rainy season, we drive with our motorscooters from tea garden to tea garden, one more beautiful than the other. We are lucky enough to be here just at the right time for the tea plants here to be in full bloom. This is the case only once a year, and only for a short period. Those, who have ever tried to take pictures of tea slopes, will know the dilemma all too well: since it is mostly impossible to get good photos from the upper edge, great shots are inevitably related to lots of exhausting up-and-down climbing, always on the hunt for the perfect position. Fortunately, this activity comes with ever new panorama views and perspectives in rich abundance, compensating the dedicated tea slope photographer for the invested efforts. What strikes me, are the various designs and forms of the tea gardens here. 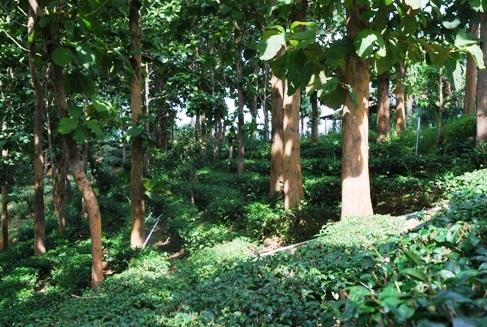 It is like each tea farmer has his very own idea of how his tea garden is supposed to look like. Also, I encounter something here that I haven’t seen anywhere else so far: although dispersed trees might be an entirely common appearance on both tea slopes and horizontal tea gardens, there are even virtually “forested” tea gardens, where the tea plants grow in the (half) shade of a treetop cover, which is not too dense, but still well deserves to be called a forest already. I am convinced that the tea yielded this way must have very special taste characteristics, and I decide to get to the bottom of this at the next possible occasion. After two or three hours of “tea garden hopping”, the young Doi Tung tea shop salesgirl’s and my tea garden guide’s father joins us. He’s been told that I am planning to buy tea from him, and now he insists on showing me his tea gardens in person. We continue for another while on the way we have come, then we’ve reached our destination. These 4 Rai (1 Rai = 40 x 40 m) are not his entire pride, he possesses two more, however somewhat smaller tea gardens. The tea farmer explains to us that this tea garden is due for a harvesting run in the next days. 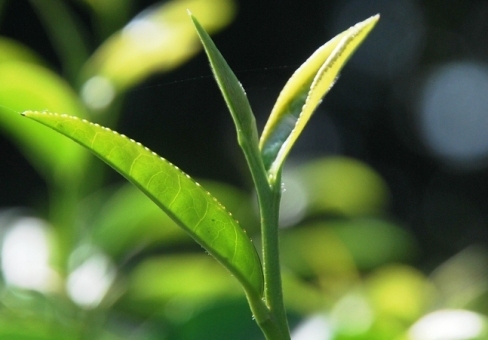 Most branches of the teas plants have strong tips, whose two upper leaves still show a particularly intensive fresh green while the uppermost shoot already reveals that it would become a tea leave soon, if they would allow it to. They won’t allow it to, it is these fresh tips they want to harvest, process and savor in particular. 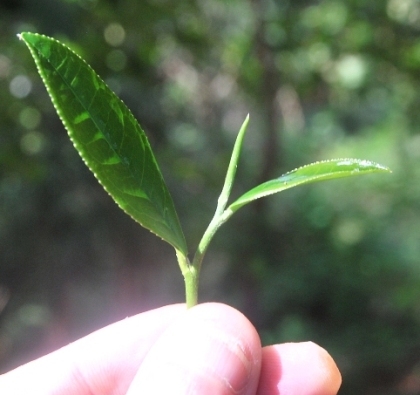 A proper hand picking of only and exclusively such tips yields the teas qualities that nowadays, given the flood of machine-harvested mass teas, are often referred to as “boutique tea”. The tea plant needs 45 days, before it has produced a new tip of equal value and thereby becomes ready for another harvest run. 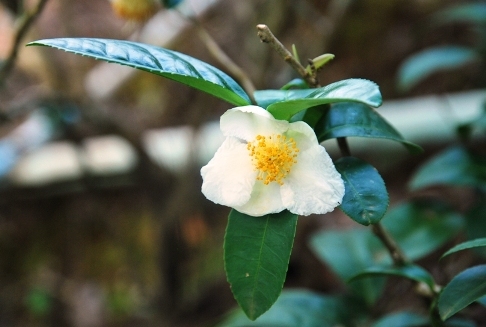 During the local winter, the tea plant takes a 3 to 4 months long break. This is also the time of the tourist high season in north Thailand and on the Doi Tung, so that the farmer and his family are able to focus entirely on the sale of the tea yield. I am told that that people from Japan, China and Taiwan come here to buy tea. A strong reference. I will spend this night in a nice little resort, the “Phutarn Resort”, located in a tiny market town not far from Ban Si Phan Rai and the Amphoe Mae Fah Luang. 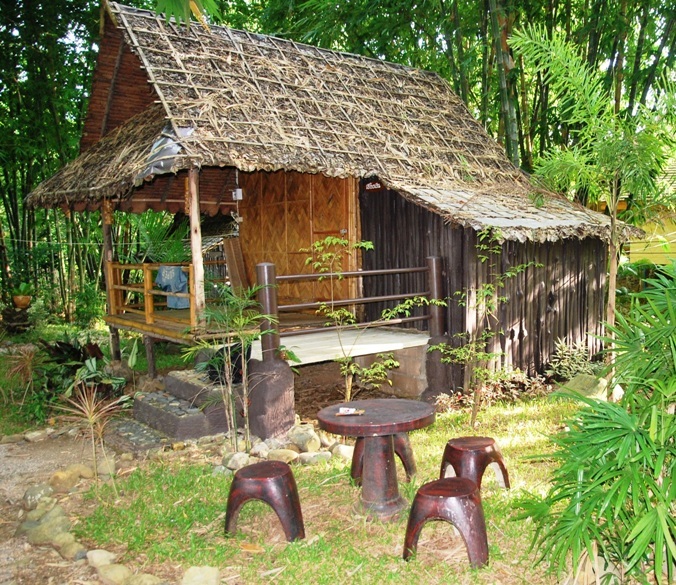 The resort, situated at a charming little river, features its own restaurant and river terrace as well as comfortable bamboo huts that look a bit warped from the outside, but whose interior offers everything you can wish for at a price of mere $US10.00 per night, from Satellite TV to a minibar and a fancy own bathroom. In the afternoon, when the Hilltribe Bazar on Doi Tung closes its doors, our young tea shop operator girl drives her motorcycle to this little market town near her home village and the community head village Amphoe Mae Fah Luang to open her second tea shop, which she operates as a second leg of distribution for her daddy’s tea until late every day. There, I try a few pots of the family’s tea from their last harvest and place my order with “papa”, whereas we agree on the same to be taken from the upcoming harvest from just that tea garden we have visited together on this day and for which he had stated that a harvest would be due. The next morning, equiped with a good package of the local Ruan Zhi Oolong No. 17, to bridge the time until delivery, I embark on my journey back to Chiang Rai and from there home to Chiang Mai.